Most Fertile Days Calculator. How To Get Pregnant With Calculator. In this modern world, it is not only important to prevent unwanted pregnancies like the days of old – it is now widely recognized that the timing of a planned conception and birth is just as important, if not more. In this regard, there have been great developments in the use of a “most fertile days” calculator to get pregnant, the most popular of which is probably the Advanced Woman Calendar from www.eovulation.com. 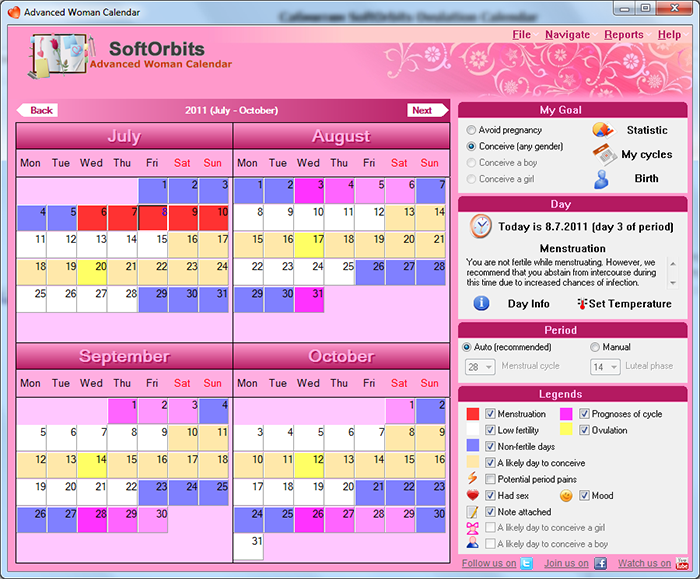 This fertile date calculator software from award-winning group SoftOrbits uses the start dates of your last three periods and instantly relates a scientifically accurate prediction of your next ovulation date, regardless of whether you are regular or not. This day will be the single most fertile day of your next cycle, with the days preceding and following forming your next most fertile days in receding degrees per day. The fertile calculator also tells you the date just days after successful fertilization that the egg will attach itself to your uterus, how many days after a blood or home pregnancy test will already be accurate, and even your most likely due date nine months after. If there was no conception, the program also tells you when the egg will disintegrate and when your next period will be. Aside from these, the Advanced Woman Calendar can even guide you through PMS and changes in your basal temperature. And for those trying specifically for a girl or a boy, guess what? The program tells you the best days for that, as well. All of these it does in easy to read, color-coded charts that you can customize to be your wallpaper. You can also write notes and program alerts to remind you of certain dates or events. 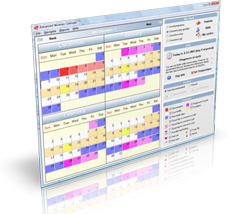 And if all you really want to know is when your next period will be, they have a simplified version free to use on their website. These and more – all at the tips of your fingers, as the saying goes.